What is cyberbullying? How can I prevent it from happening to my kids? This is one of the most popular questions we get from parents, and today we’re beginning a 3 part series on this topic for our Be Socially Smart community. 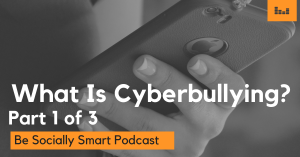 Cyberbullying is the use of technology to harass, threaten or target another person, and recent statistics show 59% of U.S. teens have experienced this type of bullying in at least one form. We strongly believe that informed parents produce safer kids. That’s why it’s vital for us to stay involved in all aspects of our kids’ digital lives. So how can we spot the signs of cyberbullying? What should you do if your child is already being bullied online? Tune in for part 1 of our cyberbullying series today, and be sure to reach out to us with any of your thoughts and questions! For better or worse, social media has completely revolutionized our world. So how do we as parents navigate the world of smartphones and social media with our kids? On the Be Socially Smart Podcast, we’ll keep you informed on all things technology and social media. Whether you are a parent of a teen, tween or elementary age kid, this podcast is for you. Be sure to subscribe on your preferred podcast platform so you don’t miss a single episode.